Icy Strait Point wins receives the Best Tribal Destinations and Tourism Leaders Awarded at American Indian Tourism Conference. At 1,300 feet, Icy Strait Point in Hoonah, Alaska is the largest zipline in the Western Hemisphere. Opened in 2007, the Icy Strait Point serves roughly 13,000 riders each year and offers visitors breathtaking views of the crystal blue waters and towering mountains that surround Chichagof Island. For the past 10 years, travelers from all over the world have come to Icy Strait Point to see you and Alaska through our eyes. We have opened the doors to the Spasski River Valley where bears roam through the riverbanks; to the rough trails through the temperate rain forest where deer and eagles make their home; and to your beautiful protected coastline where humpback whales feed. We have welcomed these travelers into the way of life here with Tlingit customs and stories. Huna Totem is awarded a Travel & Leisure Global Vision Award for Community Building! Native and local What also sets Icy Strait apart is that it is owned and run by locals and indigenous Alaskans. 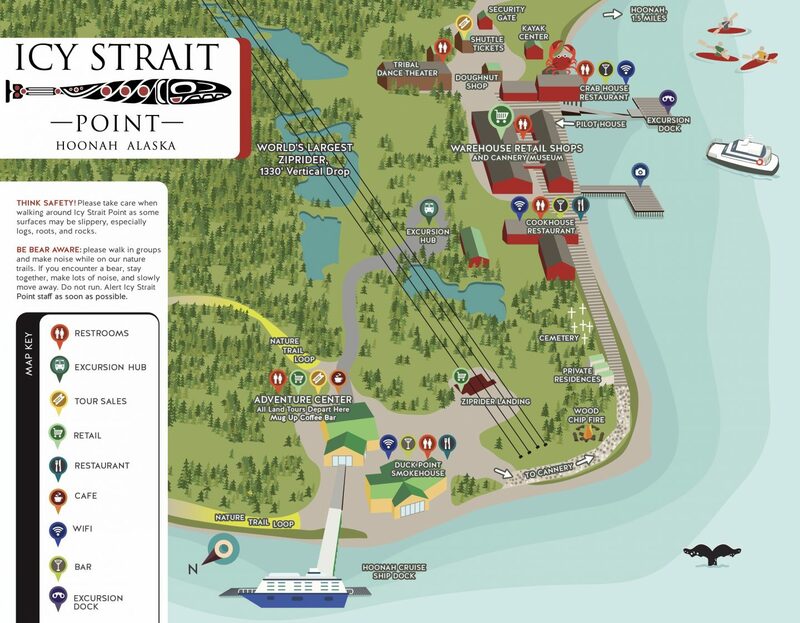 In a state where many of the hotels and tours recruit manpower from the Lower 48 every summer, Icy Strait Point’s employees, 90% local and 85% indigenous Alaskan, are truly invested in making the port work. See how the Ride-iculous crew got their shots of the world’s longest zip line. Cruise-ship passengers who dock at Icy Strait Point can opt for an excursion to Ziprider—and might luck out with a bear sighting en route up a mountain to the jumping-off platform. Manhattan-dweller and former Traveler researcher Meg Aftosmis recently took a trip on the ZipRider at Icy Strait Point in Hoonah, Alaska and sent us this video of her thrilling experience. Laying claim to the longest (5,330′) and highest (1,300′) zip line in North America is the ZipRider at Icy Strait Point, a sprawling wild expanse on Chichagof Island in Alaska. The Travel Industry Association, a national industry advocacy group, and National Geographic Traveler magazine named Icy Strait Point the winner of a “Travel to a Better World” award, which recognizes the best in the global tourism industry along with its Odyssey awards.